The day after a crazed Bernie Sanders campaign worker fired 60 rounds in an attempt to assassinate congressional Republicans, state Rep. Katrina Shankland (D-Stevens Point) took to social media to perpetuate the kind of rhetoric that seemingly motivated gunman James Hodgkinson. 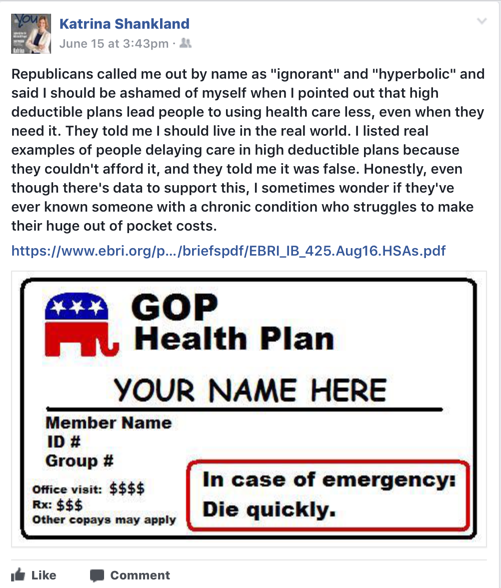 On Facebook, Shankland posted a mock “GOP Health Plan” card reading “In case of emergency: Die quickly.” The unsubtle implication is that Republicans want people to die – a sad local installment of a national messaging campaign by Democrats desperate to stop the repeal of Obamacare by any means possible. Her social media stunt came with a mournful missive complaining that she had been chided at the Joint Finance Committee for more over-the-top and uninformed comments about new health plan options for state employees the committee adopted. In an effort to save $63.9 million of taxpayer money, the budget committee agreed to direct the state’s Group Insurance Board to add Consumer-Driven Health Plan (CDHP) options for state employees. CDHPs generally cover basic medical needs, but offer a lower premium in exchange for higher deductibles. CDHPs are often paired with tax-advantaged health savings accounts (HSAs) or health reimbursement arrangements (HRAs). Employees, often supplemented by employer contributions, can put pre-tax money into an HSA to cover out-of-pocket costs and roll the account over year-to-year. Under plans coupled with an HRA, employers reimburse employees’ heath costs. The two methods can also be paired. Both HSAs and HRAs coupled with a high-deductible plan give healthcare consumers direct control over their healthcare dollars, creating much-needed price competition in healthcare and driving prices down. Shankland claimed giving state employees the option of a high-deductible plan would cause people to forego life-saving care and ostensibly get sick and die. Women would skip breast exams, and people with chronic conditions would allow themselves to wither away. But in reality, CDHPs, HSAs, and HRAs are increasingly popular among large employers. In 2013, 39 percent of employers with 500 or more employees offered HRA- or HSA-eligible plans. Rep. Mary Felzkowski, who actually owns an insurance firm, tried mixing in some facts. Employers have an innate incentive to keep their employees healthy and productive, she said. Add to that employees’ desire to keep their monthly premiums affordable amid rising healthcare costs and CDHPs come out as a pretty attractive option. After scolding Shankland for her over-the-top fear mongering – saying she “should be ashamed” – JFC co-chair Rep. John Nygren also interjected with another inconvenient truth omitted by Shankland: the proposed CDHP option is just that – an option. No state employee is going to be forced into a health plan they don’t want. If they like their plan, they can keep it, unlike the millions of Americans whose coverage was cancelled thanks to progressives’ beloved trainwreck, Obamacare. Wisconsin state employees will be able to choose a plan – if they think it’s best for them – with lower monthly premiums while covering out-of-pocket costs with an HSA or HRA, so they’ll still have essential health and medicine covered. Offering more plan tiers with CDHP options will also save taxpayer money and help “bend the cost curve down” in the overall health care market. 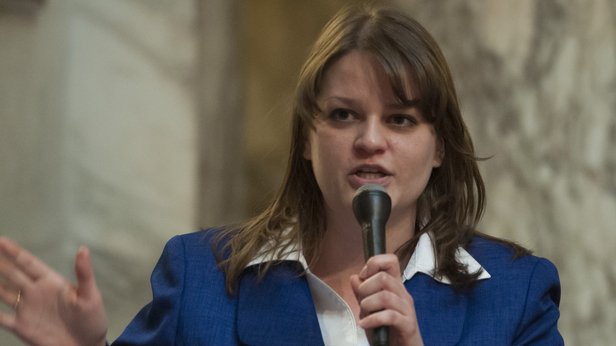 Shankland is just plain wrong – her rhetoric displays her ignorance about the complexities of health insurance – and the timing of her “Republicans want you to die” rant betrays a jaw-dropping lack of judgment. Nygren was right. Shankland should be ashamed of herself – not just for her ignorance and over-the-top death mongering rhetoric on health insurance, but for her unabashed eagerness to throw gasoline on the political bonfire that nearly took a congressman’s life.